Understanding important business relationships is a critical, but difficult exercise that every company faces. Firms need to make decisions regarding how best to allocate resources — and in particular how to spend their time. Identifying the right people to engage is a strategic necessity. How often have you organized an event without knowing who to invite? How many times have you wanted better information on who you know in different cities? Have you ever tried manually to capture important data surrounding a previous year’s activities? Too often individuals, teams, and firms spend hours together discussing their connections, coordinating with assistants, and exploring documents and spreadsheets to determine who to call, meet, or connect with. Seldom do folks have the resources — time or data — to extract optimal insight from their networks. Instead, decision making is grounded in memory, guesswork, and manual attempts at network research. Confronted with a situation for which data is so scattered and complex, the best answer is no longer a priority — any solution will do. The process is arduous and time consuming, preventing other, more important work from getting done. Affinity is a smart network and workflow management solution built to solve these problems. 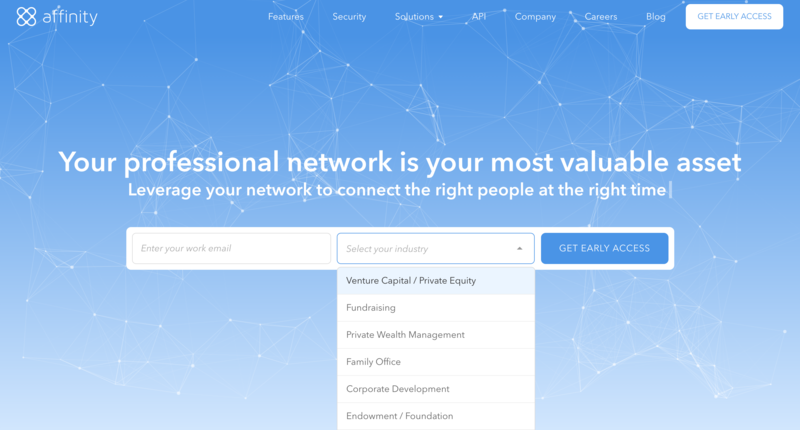 Using your email and calendar data, artificial intelligence, and machine learning, the platform automatically surfaces these answers about your network in seconds. No more reliance on memory. No more guesswork. Affinity will help equip you with high-quality information and context about the people critical to your organization’s success. Organizing your strategy for next quarter? Ask Affinity which seed stage companies you saw last year, or which Series A, B, and C companies you engaged. Get a sense for which companies you met with, in which industries, and when. Want to understand how to source better deals more often? Ask Affinity who introduced you to the most companies, and which ones. Affinity’s intelligent introduction detection algorithm collects data on introductions, making it clear who has sourced you the best deals. Analyze anything related to every person and company your firm has ever spoken to, including filtering for location, industry, job title, organization, and more. Affinity stores your data such that you can search, segment, and track your network like never before. Email and calendar data are some of the largest, most valuable, and most accessible data sources we have. That being said, this rich information has historically largely been ignored. Affinity links with your email and calendar to structure your data, making it possible to ask any question about your network and get data-driven answers right away. The intelligent algorithms compute tens of thousands of data points, and they scour the web — cross referencing your information with public data resources like Crunchbase — to generate instant insights. Learn about who the most valuable people are in your network. With actionable data surrounding who you know, you’ll make better, more empirical decisions regarding your time and the people with whom you do business. Excited about the possibilities? We are too. This is only the beginning, and potential abounds. Join our waitlist below to get early access and see for yourself how Affinity can help you! You can also follow us on social media channels: Twitter, Facebook and LinkedIn.